Magnesium has been found to regulate and improve blood sugar control, play a vital role in the secretion and function of insulin, is necessary for insulin to open cell membranes for glucose and helps the body digest, absorb, and utilize proteins, fats, and carbohydrates. Those who are low on this mineral (a survey conducted by The Gallup Organization found that 72 percent of adult Americans fall short of the Recommended Dietary Allowance of magnesium), increase their risk of developing diabetes mellitus considerably. In the new Brazilian study, researchers evaluated magnesium intake and blood levels in 51 type 2 diabetes patients. They administered blood sugar (glucose) tests to measure the levels of glucose in the patient’s blood. A “fasting blood sugar test” was done which measures blood glucose after a person has not eaten for at least 8 hours. Normally, blood glucose levels rise a bit after eating. This increase causes the pancreas to release insulin so that blood glucose levels do not get too high. Blood glucose levels that remain high for an extended length of time can damage eyes, kidneys, nerves, and blood vessels. The researchers noted that because magnesium is so vital to energy supply and utilization in the body, they were not surprised to find that lower levels of magnesium in the blood led to metabolic malfunctions such as diabetes. They also concluded that the impaired kidney function connected with diabetes mellitus might explain the higher levels of magnesium in the urine, which combined with insufficient magnesium intake, caused the high blood sugar levels. 1.Include frequent small meals of protein (fish—especially wild salmon, to avoid mercury—and free-range chicken and meat) and complex carbohydrates (whole grains, legumes, and vegetables), as well as the avoidance of simple sugars and white flour. 2.Use stevia as a natural sweetener which comes from the leaves of a plant that grows in South America and avoid the sugar substitute aspartame, which can worsen blood sugar control and cause weight gain, headaches, nerve damage, and eye damage, because it is made partly from wood alcohol, which breaks down to formaldehyde. 3.Supplement with an absorbable form of magnesium. You cannot get sufficient magnesium from foods alone due to the depleted soils and processed foods that our modern diets consist of. 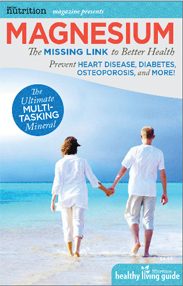 Not all forms of magnesium are absorbable by the body. One of the most absorbable forms of magnesium that is safe is magnesium citrate in powder form. Source: Sales CH, Pedrosa LF, Lima JG, Lemos TM, Colli C. Influence of magnesium status and magnesium intake on the blood glucose control in patients with type 2 diabetes. Clin Nutr. 2011 Jan 31.